The Making Waves blog: Proact Sweden Live! As you all Nansen followers should know, Nansen has worked hard with finalizing a new platform for Proact's websites. 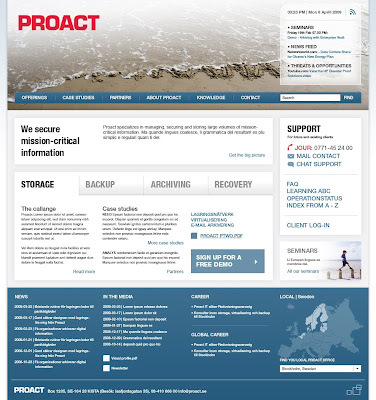 Proact is a company, listed on the Swedish stock market, with experts on storage, backup/recovery, archiving and disaster recovery. About one month ago the Proact Group site, proact.eu, was launched and two weeks after the Latvian proact.lv followed. Today is the big day for Sweden when proact.se is ready to go public. It has been impressive to see how great Proact has managed the coordination of content and structure and managed to syncronize different needs and wishes from 8 markets. Well done! The website is of course built on EPiServer CMS 5 and Microsoft .NET Framework. The website is also integrated with a translation service from Languagewire to make the publishing process as simple as possible for all markets.